I'm deep into NaNo this month on a new book, so here's a dip into the archives for one of my favorites. Enjoy! Some writers craft meticulous settings and build an amazing worlds, while others use the minimal details to suggest a place. But no matter what kind of story you write, it takes place somewhere. Maybe it's a small room, a town, or even a galaxy. What's more, setting can be a backdrop or a character in the novel. It's versatile! 1. Where are your favorite places? If you’ve always loved a particular location, that passion will spill over into your novel’s setting. A favorite city could be the perfect place for your characters to live. If there’s no specific place, something more general like the beach or the mountains could work as well. 2. What mood or atmosphere do you want the story to have? If you want a dark and creepy novel, odds are you won’t set it on a bright and sunny beach. (or maybe you will, because you'll want the contrast) The atmosphere of a place bleeds into the story and will either enhance the mood, or give all the wrong signals if it’s conflicting with what you envision. 3. What settings are common to your genre? If most of the novels in your genre are set in small towns, that’s a pretty good indication that readers expect and look forward to this setting. But that doesn’t mean you have to go with the norm. Do you want a similar setting or something new? Maybe a compromise with a slight twist to what is common for the genre. 4. What location would enhance your story’s conflict and/or theme? If your story is about the effects of war, setting it in the middle of a war gives you a lot to work with. If the theme is love, setting it in the most romantic city in the world might be a solid idea. You might even want to flip it and use the setting to show what’s lacking in that conflict or theme, like having a love story set in a land of war and hatred. 5. 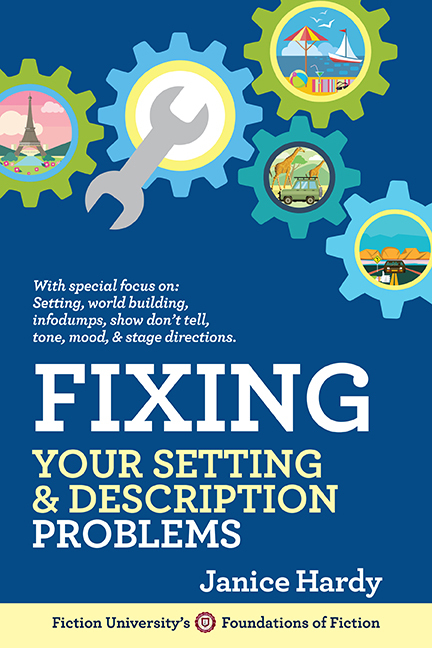 What are three critical elements your setting must have? Odds are you have things you know you want from your setting. Perhaps they’re plot elements, or character history, or even a social construct you want to explore. If there’s something critical about your world and setting, make sure you choose a place that will reflect that. 6. Do you want a real or fictional setting? You might want the reader to bring her own memories and views of a real place to the story, or you might want to create an entirely make believe world. A fantasy realm, a distant planet, or even a small town that doesn’t actually exist. Real places might require a little more research to ensure you’re not getting facts wrong, but they also bring a sense of realism to the story. A made up place gives you the freedom to do whatever you want, though it might take more work to build that world. 7. Is it a small or large scale location? Consider the scope of your setting. Maybe you want a small town, or just a small room. You might want the story to spread across continents or galaxies. 8. Do you want an urban or rural area? Big cities offer things rural places don’t and vice versa. Even if your setting is made up, you have options on how metropolitan it will be. 9. Does the protagonist know this place or is she new to it? A setting feels differently to someone who’s live there her whole life versus a newcomer. Do you want the reader to feel like a newcomer as well, or like a native? 10. Do you want a setting you’re familiar with or something you’d need to research? The setting brings so much to a story, it's worth taking time to find the one that best enhances that story. How do you decide on a setting? Post your entry in the comments section. Deadline for entries is next Monday, July 8th, at noon, EST. I'll choose the winner and post the finalists on Tuesday, July 9th. Winner gets a 1000-word critique. Open to all. Great things to consider, Janice. I still remember how you shared about picking the setting for The Shifter. I think it was awesome how you picked some of a real setting that had what you were looking for and used it to create the setting for your story. Natalie, thanks! It's my lazy side that take over there, but it does provide a nice foundation. Anything that makes the process easier is good! That's some good rules to follow. Keri kicked off her shoes and dug her toes into the sand. Focusing on the almost-unendurable heat rising from the beach might keep the scream down. Maybe. Her friends dropped their gear in a heap. “C’mon, let’s go in!” Veronica dashed off towards the waves. “I’ll watch our stuff.” Keri waved weakly as they ran off, laughing. The brutal sun pounded down on her head, driving her to the ground. She hunched inside her hoodie. Maybe she could give herself heatstroke and have an excuse to go home. Keri frowned as her eyes swept up and down the narrow strip of sand, taking in the relaxed, smiling beachgoers. There was nowhere safe to look. This direction: her friends about to get slammed by a monster wave and sucked out with the undertow. That direction: little kids flirting with the water’s edge, parents yards away and yakking over sangria. Further on: a stone-still lifeguard lounging on her perch, probably asleep behind her mirrored shades. Beside her: a lipstick-red woman courting melanoma. Keri closed her eyes. All she needed now were some circling shark fins to make the horror complete. Something purple washed up beside a toddler. Keri was on her feet before she knew it. She grabbed the kid’s shovel, flipped the Portugese man o’ war into the rocks at the base of the breakwater and thrust the shovel back at the now-wailing child. Laura opened the door slowly, her right eye twitching slightly at the screeching hinges. She hoped the sound of the shower drowned out that noise, but she wasn’t deterred. Then the smell of freshly sprayed, canned cinnamon and apple slapped her in the face. At least it did its job she thought, giggling slightly before she could help herself. Throwing a hand up to cover her mouth, she looked into the mirror of the oak medicine cabinet, watching his form behind the light blue curtain. He made no noise in response and his movements didn’t stop. He hadn’t heard her. She let out the breath she hadn’t realized she’d been holding and continued into the room. The cool grey tile chilled her; she looked down at her exposed flesh, knowing he would be pleased. The confidence she normally lacked was bursting from her thanks to the two sea breezes she’d consumed. She was unapologetic for at being a cheap date. The water shut off abruptly, causing her panic in the unplanned silence. Unsure of what to do next, she sat on the only thing there was to sit down on. Turning sideways, she crossed her legs and let her blonde hair spill over a shoulder. He threw the curtain open, standing mouth agape at her naked form. She smiled, he was obviously pleased. “Hey there big boy.” she slurred as she slid off the toilet landing with a thud on the cold tile. CA Heaven, smart. Knowing what you want out of your writing and work goes a long way to knowing how much time to spend on what. Saves you a lot of worry, too! The water dulled each grain of sand to blunt redundancy. As numerous as the stars in the sky and burning as hot as a dying supernova. The heat lay like a shroud over anything that made a sound. Even the insects only dared sing in pianissmo minor tones. A trail of clouds strangled the horizon line where the last crimson stain of sun was vanishing into the ocean. The palm trees bowed their leaves in defeat to the oncoming darkness. Not even a wind to breathe life back into them. Broken glass circled a rock at the border between beach and cement. It would turn to sand, one day, if given the chance. But the resort staff would dispose of it before it had the chance to attain that potential. Instead it was just another broken dream. The flowers all looked up at the sky. As if in disdain of their surroundings. Elitists who whispered amongst each other about the ugly scars of humanity all around them. They knew the secret to simplicity but kept silent for the pleasure of seeing humanity suffer. Empty beach chairs sat straight-backed under folded umbrellas. Each one’s age evident by the sag where a thousand people had sat. Leaving the weight of their troubles behind on the sun-bleached plastic. A few discarded chairs had broken under the burden. He looked at the crumbled pink slip in his hand. He didn’t know why he thought he could escape it here. For setting, I just pick a general location and then roam around a tour book until I find something that catches my eye as a potential place. It doesn't have to be a place I've been. Part of the fun is being a book tourist. For a story I'm researching now, I picked the location because I wanted fog for the story. But I'm also a lazy researcher. I don't want to research the setting as if I were doing a term paper. I pick a couple of good tour books -- what are the unusual features, what animals and plants are there, etc. Older Google free books can also be sometimes helpful. I got some really great descriptions of how the sea behaves in that area from a county history. I also look for photos of the place to help me build on the setting. I've recently been experimenting with picking a date in history for the story and researching the weather. This is NOT for the .1 percent of the readers who will nitpick the story, but to make me pay attention to the details that I'm likely to miss entirely. It forces me to make a conscious decision about time of the year and think about if it's cold or hot or windy (time of the year is important to get the fog). For my Point Reyes research, I also checked when low and high tide was because that would make a difference in a key piece of the story. BTW, none of this is complicated. I probably took 2-3 hours on the research, mainly because I want to have enough that I could reuse the research on future projects. I've enjoyed reading others setting descriptions. Here's mine. I mumbled a reply. It was all too soon, a mistake, it hadn’t really been my choice after all, to be here now gripping the little hand in mine. The paper work all signed at the front desk. I was committed now. I squinted into the corners of the ceiling, searched for a dark recess at the edge of the room; nothing, no dark space or quiet corner to hide in, no den to retreat to. No unseen space to call my own. Correction, her own. The little hand tugs in mine, pulling away. “Hello. I’m Zoe.” My daughter addresses the woman with confidence. Distant squeals reach our ears. Freed from my grip she darts into the bright independent world of the pre-school centre. Linda, love the term "book tourist." I also love the weather tip! What a great way to get into the feel of a setting from a unique angle. It's the small things that can really bring a setting to life. Fantastic ideas. The rainbow of colors blurs in my eyes. The sun has freshly risen, drowning us in light and brilliance. The pimpled hills shimmer with color and plastic. Behind them towers rugged rock, torn bare by the wind. The valley is empty, echoing with the crunching of our steps. “The boarding house is getting full,” he says, peeling his hand away from mine to pluck a pink baggie from the ground. His fingers play around with silver ring inside it. My eyes float past the hill, and a spear of sunlight curls around my head, blindfolding me. Everything under our feet glows. The mingled squawks of crows flying overhead wrench through the silence. “Move where?” My voice flies over the polka dotted hills. It's so quiet, only the rustling of leaves and grass behind us brushing in my ears. Two flies buzz around a rotten rose that’s squished between grimy garbage bags. My face crunches up at the repugnant smell blown into my face by the wind. Then I catch the spiciness of his cologne. “It’s not supposed to be crazy. It’s supposed to be a marriage proposal.” That’s when he squelches down on one knee. People like to say that small children see their parents as saints. And for the most part that might be true, but Maxwell knew from the age of five and a half years old his parents where hardly higher than the dirt that liked to stick to his clothes and get him in trouble. From the age of 8, he knew what the word alcoholic meant, and by the time he was 10 he knew how to pay for a weeks worth of food with just fifteen dollars. The dysfunctional family lived in a miniscule house that was painted an awful shade of yellow. The inside wasn’t much better, what with peeling wallpaper and the always present smell of cigarette smoke that liked to stick to Max’s clothing and never leave. The electric bills were never paid, neither where the water bills. The only thing that kept them from getting evicted entirely was that the landlord didn't give a damn about this house. Hehe, old school! I hope we both have healthy, happy babies!